When Jayden was a baby, his bouncer was an absolute must-have. While I wore him most of the day in a wrap, there were times when I needed to put him down in order to take a shower. Whenever I took a shower, I brought the bouncer in the bathroom with me and he would be content. Jaxon, like his big brother comes along with when Mommy needs to take a shower. We kept the bouncer, but he hasn’t been too interested in it. Instead, he loves his Bright Starts Portable Swing from the Sunnyside Safari collection. It’s funny how babies have their own personal preferences. The swing is amazing! I mean, it’s a simple swing, but sometimes simplicity minus all the bells and whistles is best. The Bright Starts Portable Swing is very light-weight and folds up easily for transporting or storing in small spaces. The padded seat is also very durable and machine washable. Ours has been through a few diaper accidents and washes and it is just as bright and whimsical as it was the first day we started using it. The seat reclines in two positions. We’ve kept it on the lowest position from newborn to six months. The Bright Starts Portable Swing has six speeds to choose from, all of which are super quiet and consistent even as baby grows. We usually default to the third speed and when the batteries are running low, we crank it up to six. Bright Starts has exceeded my expectations on the Sunnyside Safari Portable Swing. 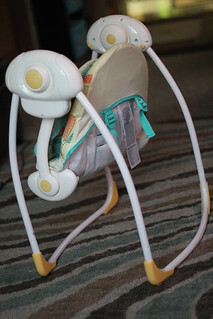 At $45.00 ($39.00 at Walmart), you have an affordable and very practical travel swing that will keep baby content during a visit at grandma’s or a quick shower. Sidenote: If you’re looking for a bounce pad/saucer, may I suggest the Bounce Bounce Baby – another budget friendly Brights Starts fav! Connect with Bright Starts on Twitter & Facebook. Can you believe that tomorrow will mark the first day of Spring? Ahhh, how I love the season. Spring sparks my curiosity and inspires me in so many ways. Spring usually sends me on a decorating/home improvement frenzy, so I always end up sprucing things up a little. To get things started this season, I recently redecorated our upstairs bath. When I started shopping around for accessories, I had no specific color scheme in mind. I just wanted something fresh and clean that would complement our pebble grey walls. I found a floral shower curtain from Target’s new Threshold line. I loved the sketched look and aqua accents. 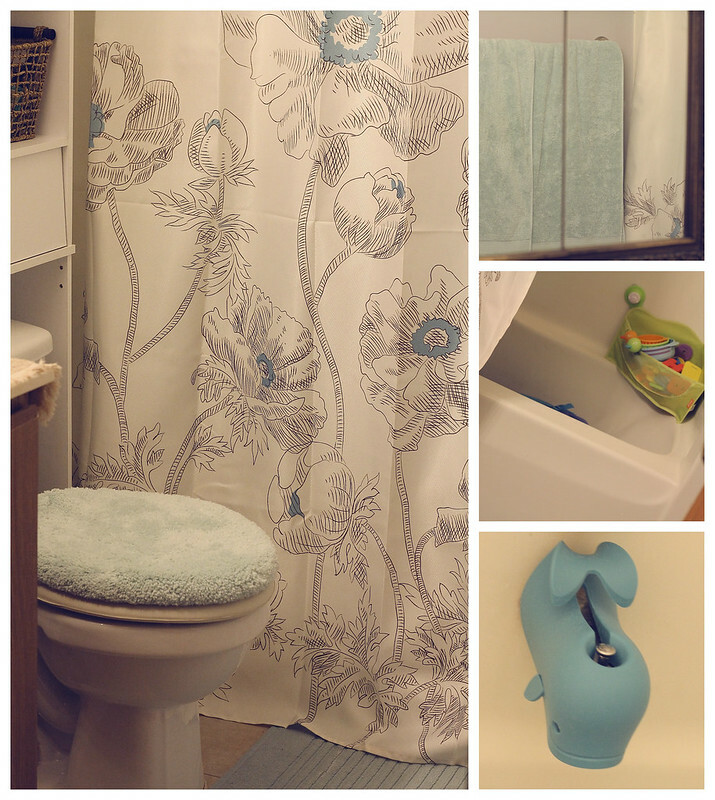 I paired the shower curtain with an aqua toilet seat cover, bath mat, and plush towels all from the Threshold as well. I grabbed some circle hooks with aqua accents to complement the pieces. They were from another brand, but really helped bring everything together. A bathroom sprucing, in my eyes, isn’t complete without bath toys, so I picked up a few toys for the boys. The spout cover added a fun element and accent to the decor. I am loving our fresh, new bathroom decor inspired by Threshold. Now that I’ve tackled the bathroom, I think I’ll focus on our bedroom next! Now that Spring is in the air, how are you dressing up the season in your home? It’s the right mix of classic and modern. An effortless elegance. Beautiful, yet affordable. Designed for a lifetime of housewarmings. It’s everything you’ll love about your home. When it comes to jewelry, I am not hard to please. 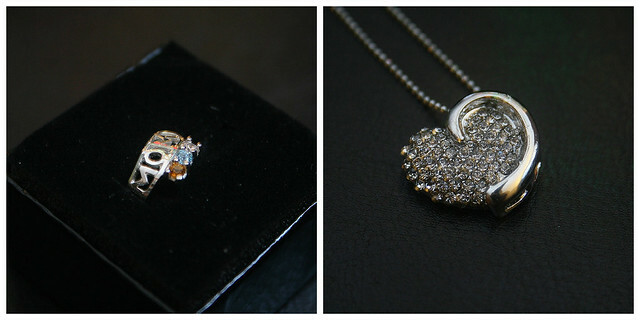 I love simple and dainty pieces and would never feel comfortable in lots of expensive bling. I personally love pieces that represent special things in my life and characteristics of myself. I seldom purchase or ask for random pieces just because they’re pretty. Most often, they have to mean something. I usually gravitate towards pieces that represent peace, tranquility, and courage… all traits that I believe are vital to raising self and children. Being a mom is so important to me and with the birth of Jaxon, I realized that I am lacking jewelry that represents my role as a mom. I only have a mother heart necklace Greg bought me over 4 years ago. I was given the opportunity to design a piece of jewelry from Jewlr. They offer just the types of jewelry I love, lots of sterling silver and white gold which are my favs, but they also have yellow and rose gold available too. 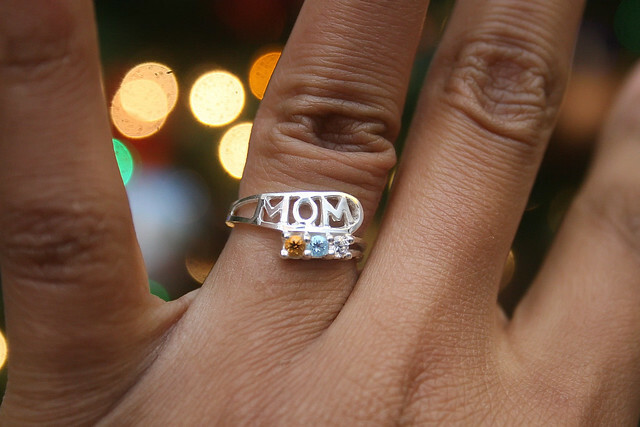 I chose the “Cherish” MOM Cut-out Ring. It’s just as beautiful in the stock photo as it is in person. I chose sterling silver with 3 birthstones; one for Jaxon, one for me, and one for Jayden… in that order :-). 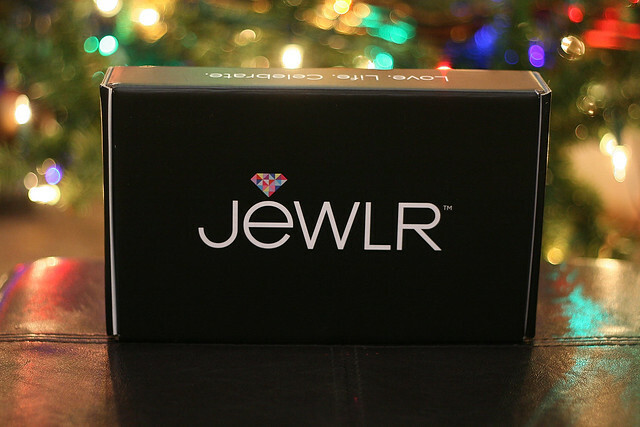 Jewlr has hand selected the perfect gifts for every recipient to help make your Christmas shopping easy. Use their holiday guide guide for helpful gift giving guidance, and start personalizing! View the Holiday Delivery options to help ensure that your special person receives their gift in time for Christmas! 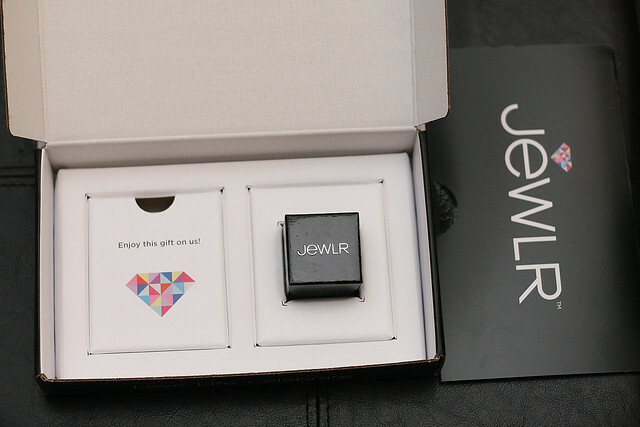 As a thank you, Jewlr will provide a free gift with every item. I received a beautiful heart necklace. 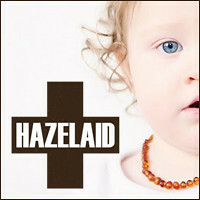 Use coupon code HOLIDAY2012 for 10% OFF everything at Jewlr! 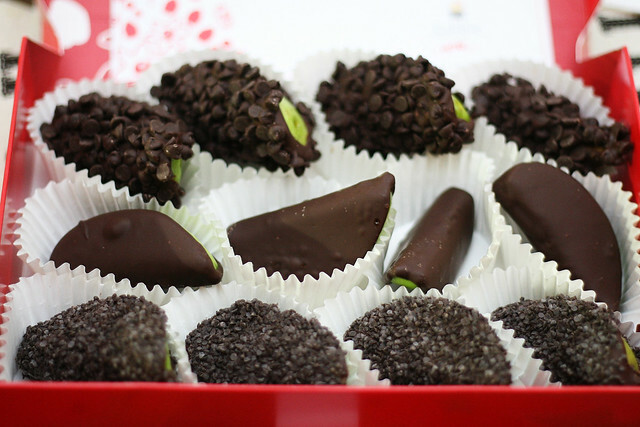 The Fruit Experts at Edible Arrangements like to celebrate the season in style, so this holiday season they are offering a selection of mouth-watering winter bouquets and chocolate dipped fruit that are sure to satisfy taste buds! 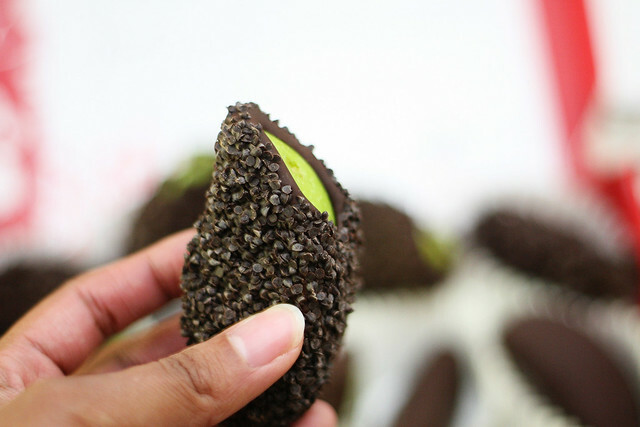 We received the Chocolate Indulgence Apples and they were delicious! What I love about Edible Arrangements is that the fruit is ridiculously fresh. You just can’t get that kind of freshness at the grocery store. They own it and continue to offer creative and tasty gifts. Chocolate Indulgence Apples are one of Edible Arrangements’ lower priced delectables, making them an affordable and great choice for coworkers, friends, and those who serve us year ’round. They’ll thank you with each and every bite. Chocolate Indulgence Apples are available for $45 and can be ordered for pickup or delivery at EdibleArrangements.com. Now through December 16th, customers will receive a FREE Swizzle Sampler with an arrangement purchase of $90+ ($25 SAVINGS)! Must enter code WWSZ1233. Shopping around for last minute costumes for the little’s? 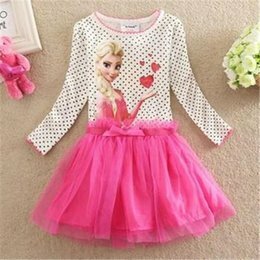 The Children’s Place has a selection of very adorable costumes for your little ghoul or goblin. From festive graphic tees to complete head-to-toe costumes, The Children’s Place has all their favorites for upcoming Halloween Festivities! There’s no time like now to hit your local TCP and take advantage of the markdowns! 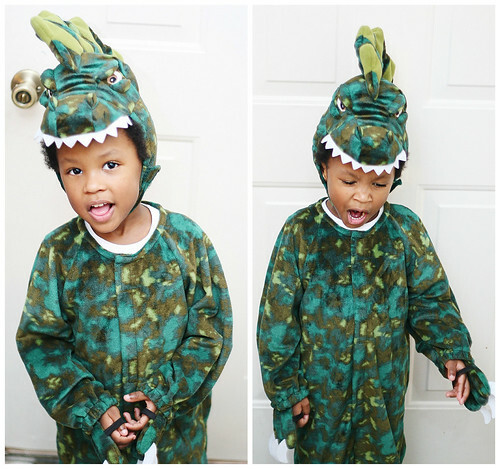 Jayden is wearing the Dinosaur costume. Isn’t it fun? It’s very well-made and toasty warm, and will get lots of love past Halloween! RAWR!!! Dress Up pieces start at just $3.95 and can be purchased In-store or at ChildrensPlace.com. Our favorite fresh fruit basket company is offering an assortment of delectable treats for Halloween and Fall. The Halloween entertaining collection features pineapple slices in eerie shapes (ghosts, black cats, bats), boxes of dangerously sweet chocolate-dipped apple wedges, and keepsake pumpkin containers. We received the Batty Bouquet and it did not disappoint! All of the fruit was SO fresh and delicious! We snacked on some and saved the rest, including the decorative mustard greens for smoothies. 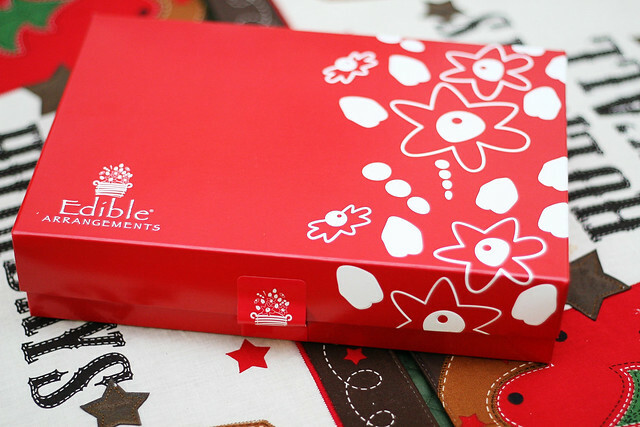 Edible Arrangements are always phenomenal and I just love what they are doing to celebrate different seasons -puts a spin on an incredible product! These entertaining arrangements start at $42 and can be ordered for pickup or delivery at EdibleArrangements.com. I recently previewed some Halloween goodies from Tiny Tillia by Avon and thought they were too cute not to share. Adorable and affordably priced, Tiny Tillia is offering a little something for all babies this Halloween season. How cute are these warm, coverall costumes for baby’s first Halloween? They are practical for the season and darling enough for photo opps! 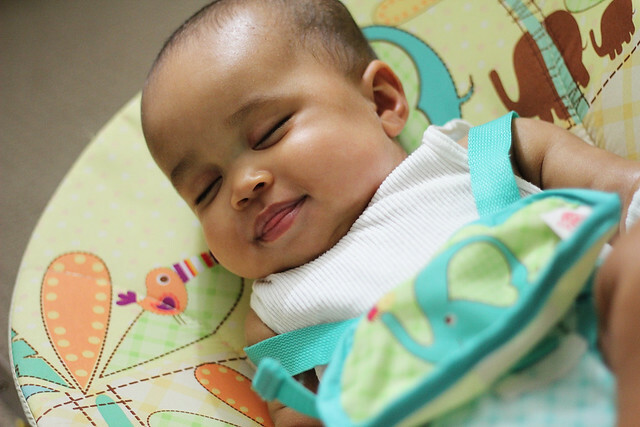 For baby’s first Halloween treat, the My First Halloween Bib’ll keep baby’s costume mess free. What’s Halloween without festive socks? The Halloween Sock Set is sure to add the perfect touch to any Halloween outfit. For the older ones, there’s the Halloween Memory Game, which lets little ones exercise their memory skills by matching flashcards featuring characters from Tiny Tillia. Products featured can be purchased at Tinytillia.com or Avon.com.